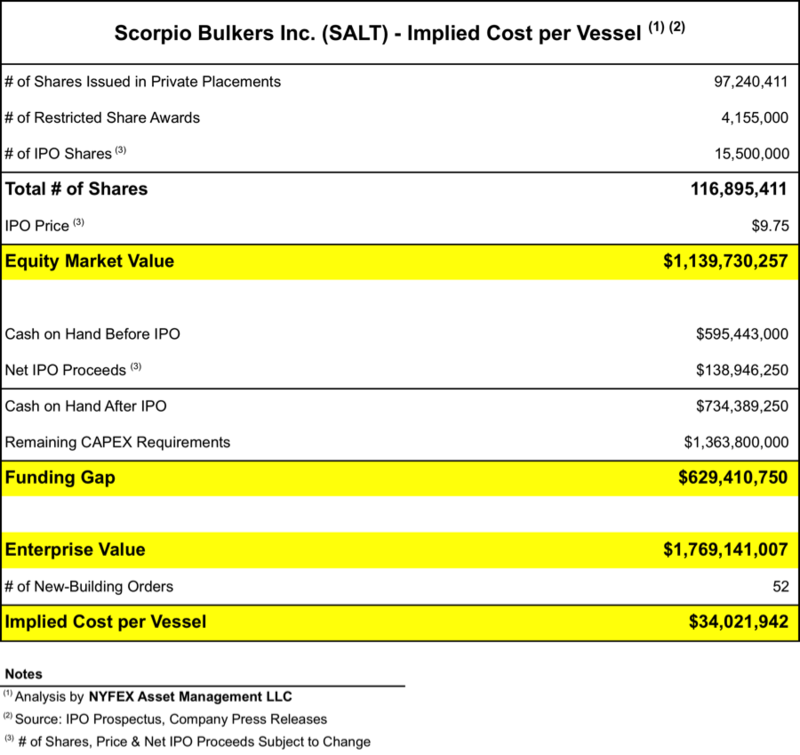 NYFEX Equity Research: The Coming IPO of Scorpio Bulkers Inc. This week I turn my attention to the coming IPO of Scorpio Bulkers Inc., an ambitious dry-cargo start-up led by the same management team as Scorpio Tankers Inc. (STNG). Scorpio Bulkers announced its initial public offering of 15,500,000 shares last Friday, fittingly on the same day Orthodox Christians were celebrating Saint Nicholas, patron saint of sailors & merchants. The IPO is due later this week, and shares of Scorpio Bulkers will concurrently commence trading on the New York Stock Exchange under the symbol SALT. The IPO will culminate a frenzy of activity since the company’s founding in March 2013. 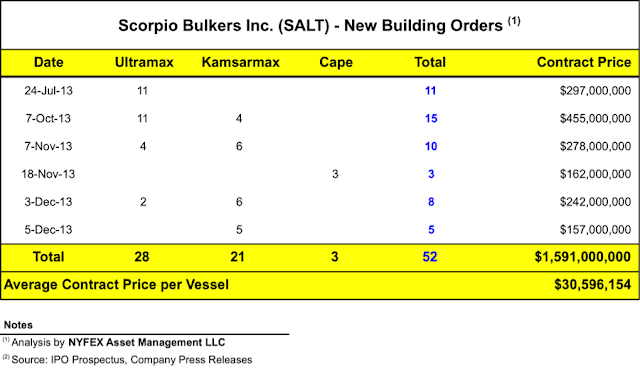 During the past nine months, Scorpio Bulkers has entered into contracts for 52 new-building vessels (28 Ultramax, 21 Kamsarmax, and 3 Capes) with a total price tag of $1.591 billion, or an average $30.6 million per vessel. The vessels are scheduled for delivery in 2015-2016, with the exception of two Kamsarmax vessels that will be delivered next year. These blockbuster deals easily surpass the previous record for similar orders, set by Eagle Bulk Shipping Inc. (EGLE) in July 2007, when it agreed to acquire 26 new-building Supramax vessels for $1.1 billion, or $42.3 million per vessel. During the same period, the company has also raised $824 million in net proceeds from three private placements in Europe. With its coming debut in the US, Scorpio Bulkers is aiming to raise an additional $139 million in net proceeds, assuming an IPO price of $9.75 per share. The final tally will depend on the actual IPO price and the total number of shares sold, including any exercise of overallotment option by the underwriters. None of the new-building orders has any fixed employment attached. In fact, the company’s business strategy is to trade the vessels in the spot market, through commercial pools that are yet to be formed. It remains to be seen how efficiently these commercial pools will handle spot chartering requirements for 52 vessels. By way of comparison, I must note that when Eagle Bulk Shipping acquired its new-building contracts, 21 of its 26 vessels had long-term employments attached. It would appear that Scorpio Bulkers is primarily aiming to capitalize on a medium-term cyclical recovery in shipping asset values. Perhaps its real goal is to sell most of the 52 new-buildings before they are actually delivered from the yard, or soon thereafter. This article will provide a layman’s guide to the company’s IPO. I will start with the pricing of the IPO, and what it means to an investor to purchase shares at the assumed $9.75 per share. 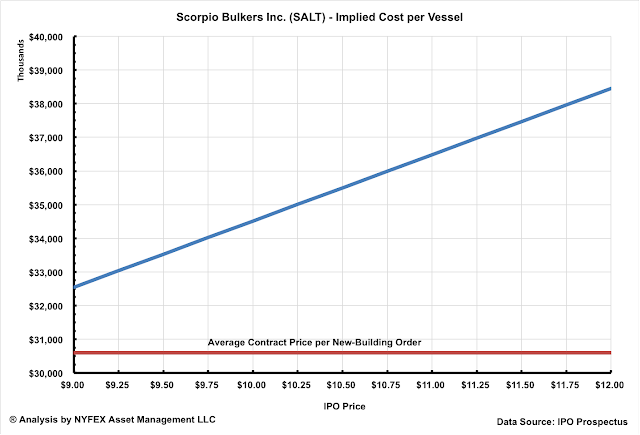 Scorpio Bulkers may have ordered its initial fleet at an average price of $30.6 million per vessel, but an investor buying its shares at $9.75 a pop will be acquiring the fleet at a higher implied cost. Based on information provided in its IPO prospectus, and assuming that Scorpio sells 15.5 million shares at $9.75 per share, it will have approximately $734.4 million to fund its new-building program. Scorpio has $1.364 billion remaining in unpaid capital expenditures, putting its funding gap at approximately $630 million. To meet this gap, the company may issue additional shares or rely on debt finance. (In fact Scorpio disclosed in its prospectus a stand-by commitment for a $330 million credit facility, secured by 22 vessels under construction). For this analysis, I assume that Scorpio will rely on debt finance to meet its funding gap. Immediately following its IPO, Scorpio will have approximately 116.9 million shares outstanding (including 4.155 million restricted shares awarded to management), valuing its equity at $1.140 billion at the assumed $9.75 per share. After taking into consideration the funding gap, an investor willing to buy shares at this price level will implicitly peg the company’s enterprise value at $1.77 billion, or the equivalent cost of $34 million per vessel. This is a nice 12.8% mark-up from the average contract price. There are three factors explaining this mark-up. First, the IPO will have a dilutive effect to new investors, since existing shareholders purchased their shares at lower prices (ranging from $8.00 to $9.21). 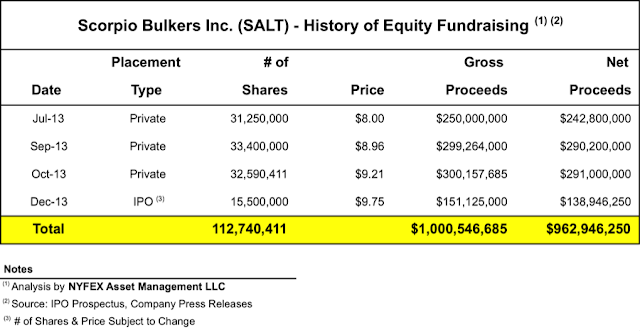 Second, the company incurred approximately $37.6 million in underwriting fees and other expenses (including the IPO). And third, Scorpio awarded 4.155 million restricted shares to members of its management. In the following graph, I show the relationship between the IPO price and implicit cost per vessel. The graph might come handy to an investor who views Scorpio Bulkers as an asset play, and would want to translate dollars per share into cost per vessel. Opponents of Scorpio’s business plan will dismiss it as a risky all-in punt on a cyclical recovery. They will argue that the cyclical recovery itself is undermined by excessive orders for new tonnage, and it may be lukewarm if it materializes at all. Proponents of Scorpio’s business plan will point to low contract prices, a still reasonable order book, and advanced eco-designs that will provide sizable fuel cost savings. I look forward to Scorpio’s initial public offering on Wall Street this week, and plan to follow up on this exciting new venture for our industry.